Each data model contains a lot of default operators. However, sometimes you may need to add a new operator to your model. Let's suppose we need “within last N days” operator which words for date/time fields, takes a numeric operand (N) and returns true if specified date is within last N days starting from today. The most important property for an operator. 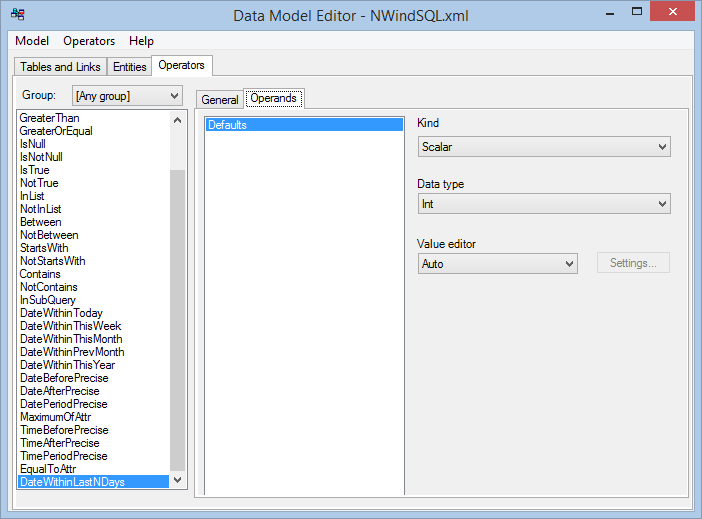 It defines the result expression which will come into generated SQL statement. and parts specify the operands. The first operand is always an attribute, second - some value entered by a user. Since this operator can be used only with Date and DateTime attributes - we uncheck all options in “Applied types” field except these two. Each operator has one or more operands. 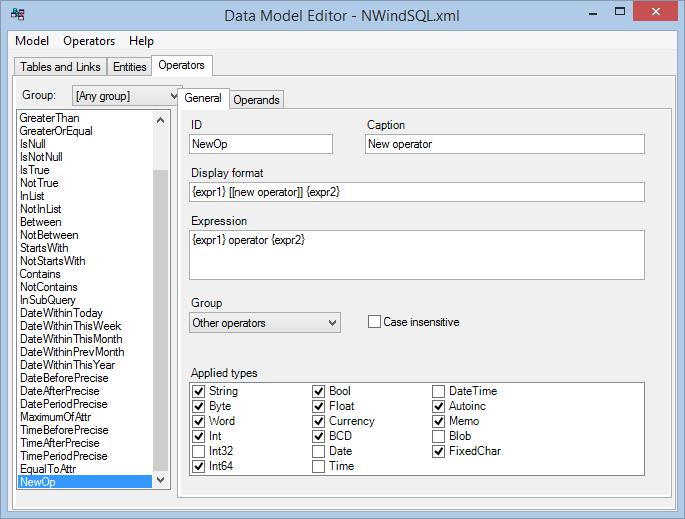 By default, all operands have the same kind and data type, but this preset can be changed. In our case, we need the second operand to be numeric (integer if more precisely) data type. To set it - just open “Operands” tab, select “Default operand” item in the list and choose “Int” in “Data type” combo box. All other operand properties let be left with their default values. N.B. 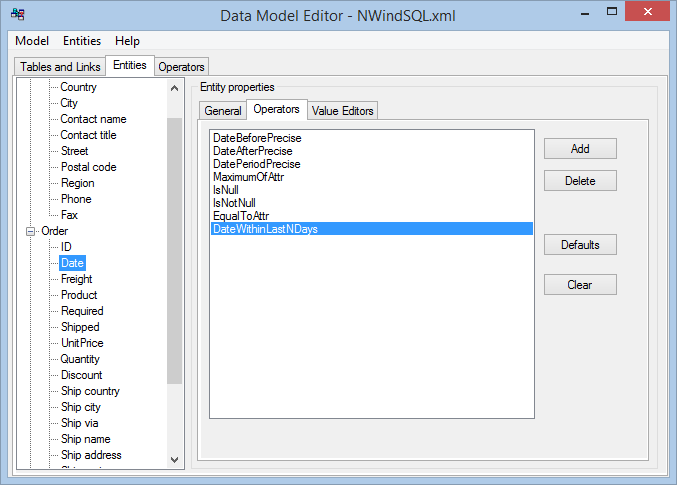 : By default “data type” property has “Auto” value. It means that this operand will have the same type as attribute selected for the left part of the condition. 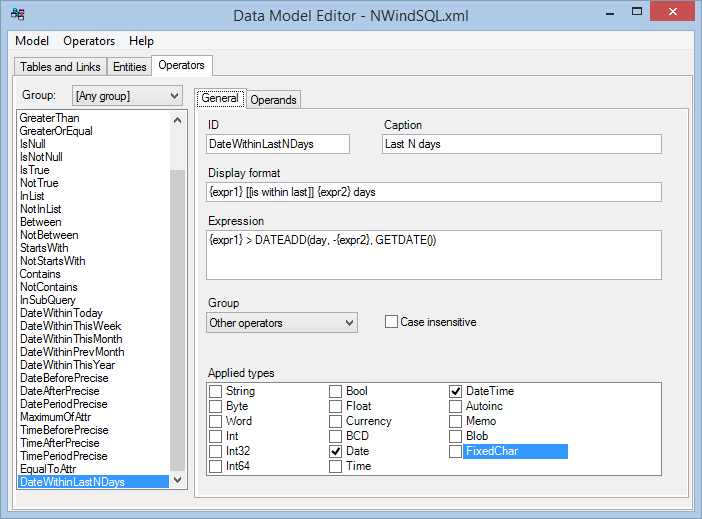 It's useful for operators which can be applied to attributes with different data types (e.g. “is equal to”).